Bring practicality and convenience into your laundry room or mudroom with this complete utility tub set by LDR. The large 19-gallon tub is constructed from high quality, durable thermoplastic to accommodate all your scrubbing and soaking needs. Use the attached side spray to direct the water where you want it to go, or move the spout out of the way completely so you can easily wash your bulky items. Box includes everything necessary for most standard installations, including stainless steel supply lines to hook up the hot and cold water, plastic drainage kit (P-trap, nuts and washers), rubber stopper, heavy-duty metal faucet, tub, legs with levelers, bonus thread seal tape and easy to follow installation instructions. Sturdy rust-proof metal legs attach easily, and the included floor levelers increase stability on uneven surfaces. One-year limited warranty. Manufacturer part number LDR 040 JS6501. Make it yours today! WITH THE ATTACHED SIDE SPRAYER, YOU CAN DIRECT THE WATER WHERE YOU NEED IT TO GO; great for filling large pails, hosing down muddy objects, or treating your dog to a rinse with warm water. Easily toggle between a steady stream or a powerful spray with just a touch of the sprayer. 360o SWIVEL SPOUT moves out of the way to give your more space when soaking or scrubbing; easily wash all your large and oversized items without needing to maneuver around the faucet. GET EVERYTHING YOU NEED FOR A COMPLETE INSTALLATION WITH ONE EASY PURCHASE: set includes large and deep 19-gallon tub, metal legs, stainless steel supply lines for hot and cold water, plastic drainage kit (P-trap, nuts and washers), rubber stopper and a quality metal faucet with an attached side sprayer. INCLUDES BONUS THREAD TAPE to ensure a leak-free connection. QUICK AND EASY ASSEMBLY AND INSTALLATION WITH ILLUSTRATED STEP-BY-STEP INSTRUCTIONS will have your new utility tub set up and running in no time. 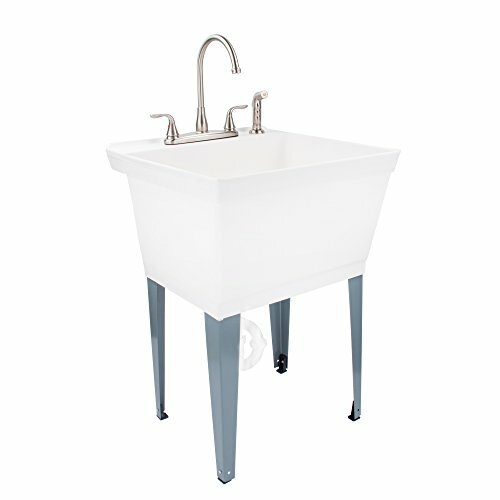 The tub measures 33¾-inches high (with legs), 22-7/8-inches wide, and 23-3/8-inches deep. Sink is quality built from durable materials to ensure years of rust-free use. One-year limited warranty. Make it yours today! If you have any questions about this product by MAYA, contact us by completing and submitting the form below. If you are looking for a specif part number, please include it with your message.